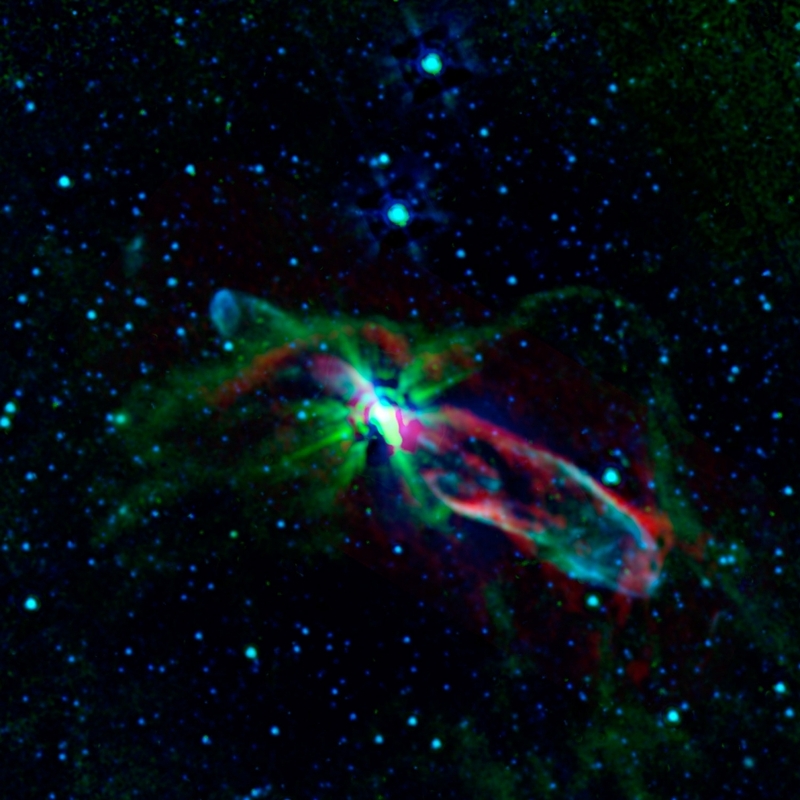 This picture was assembled from combined observations from NASA’s Spitzer Space Telescope and ESO’s Atacama Large Millimeter/submillimeter Array (ALMA) in Chile. 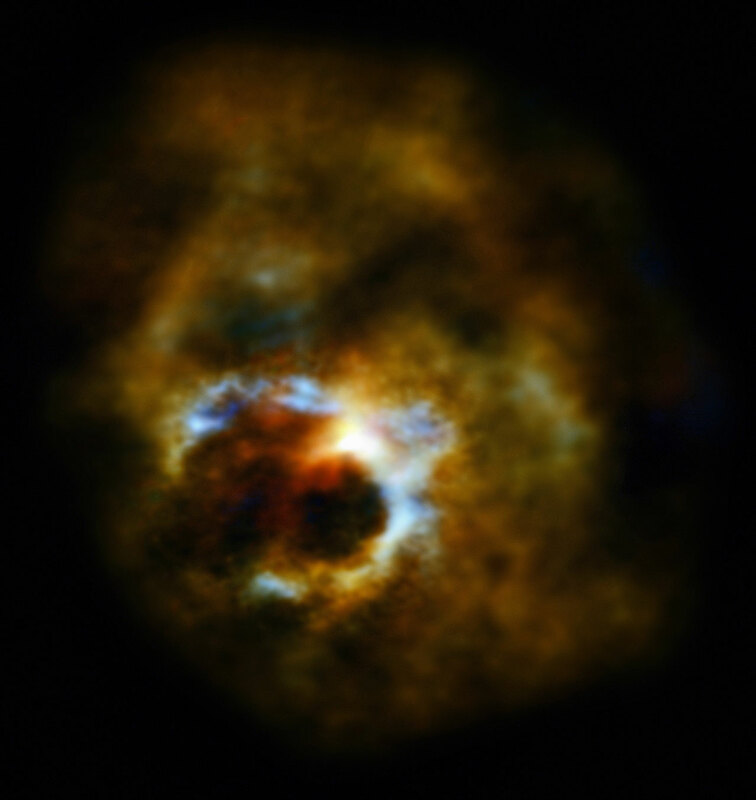 It reveals the throes of stellar birth in an object known as HH 46/47. In this false-color image the shorter-wavelength light appears blue and longer-wavelength light, red. Blue shows gas energized by the outflowing jets. Green traces a combination of hydrogen gas molecules and dust that follows the boundary of the gas cloud surrounding the young star. The red areas are excited carbon monoxide gas. This image resembles red ink filtering through water or a crackling stream of electricity, but it is actually a view of our cosmic home. It’s the central plane of the Milky Way as seen by ESA’s Planck satellite and the Atacama Pathfinder Experiment (APEX) operated at an altitude of around 5100m in the Chilean Andes by the European Southern Observatory. While APEX is best at viewing small patches of sky in great detail, Planck data is ideal for studying areas of sky at the largest scales. The two data sets complement each other and offer a unique perspective on the sky. The bright pockets scattered along the galactic plane this view are compact sources of submillimetre radiation: very cold, clumpy, dusty regions that may are being studied for information on multiple questions ranging from how individual stars form to how the entire Universe is structured. From right to left, notable sources include NGC 6334 (the rightmost bright patch), NGC 6357 (just to the left of NGC 6334), the galactic core itself (the central, most extended, and brightest patch in this image), M8 (the bright lane branching from the plane to the bottom left), and M20 (visible to the upper left of M8).